You are currently browsing articles tagged xiao long bao. The dining room at Shanghai River Restaurant in Richmond. Photos by David Lansing. Maybe you remember that the night I arrived in Vancouver, the first thing I did was go to the Shanghai River Restaurant where I met The Girl in the Purple Stilettos (Mijune Pak) and sampled their shrimp dumplings. I said I’d be back and last night I returned. Sadly, Mijune couldn’t join me as she had other plans. 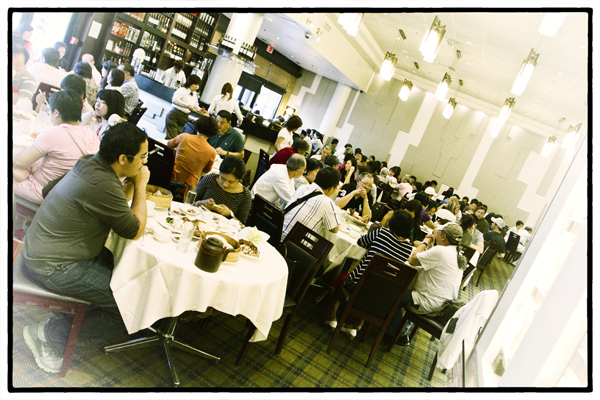 Two things about Shanghai River: It’s always crowded and the vast majority of diners come in large groups. Like eight or ten people—or more. So if you go as just a couple, it may take awhile to get seated. And if you go alone, like I did, you’re going to end up in one of the two booths they’ve squeezed into the back next to the fish tanks. My waiter, Winston Lai, with his Justin Bieber haircut. 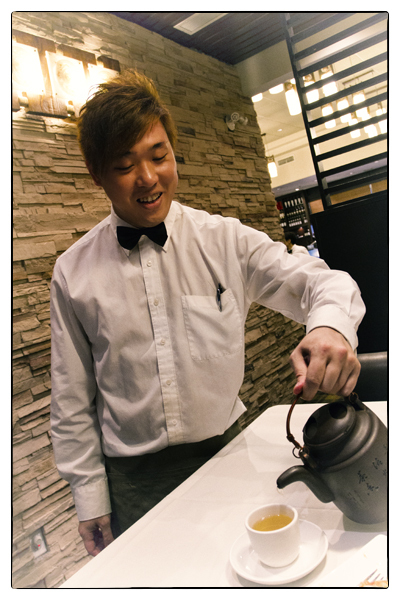 My waiter, Winston, looked like a Chinese version of Justin Bieber. Very boyish and sweet looking with that wave of hair falling across his face. And it was dyed kind of a rusty color, which seems to be very trendy with Asians right now. I think of it as a Tokyo look but I don’t really know where it came from. I didn’t want to mess with the menu. I told Winston I wanted him to bring me whatever he thought was really good and I should try. This seemed to paralyze Winston for a moment. I don’t think waiters at Shanghai River are used to people coming in and telling them to bring them whatever they think is good. So Winston says maybe I should start with the steamed pork buns which, he explained aren’t really like steamed pork buns—more like Shanghai soup dumplings, xiao long bao. “They explode in your mouth,” he said. That sounded perfect. And he was right; there were eight of them and I wolved them down in minutes while sucking on a cold Tsingtao. That sounded a bit much. So he opted for the sweet and sour soup. Which sounds kind of ordinary, but this was anything but. This was one of those dishes you’d never make at home, mostly because it would take you a week to do it. You could tell that just from tasting the broth, which was so rich that it could probably sustain an invading army marching across Siberia in winter. 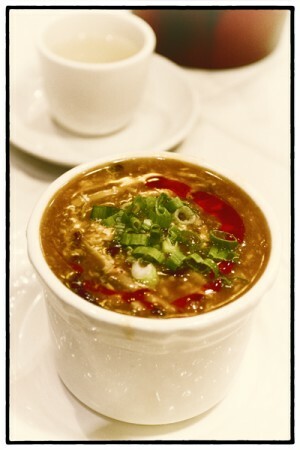 Sweet & sour soup at Shanghai River Restaurant. Get past the broth and there was shredded chicken, circles of green onions, small plump shrimp, shredded pork, bamboo shoots, mushrooms, and chiles. I mean, I could have just had a bowl of this soup and a Tsingtao and I would have been very, very happy. But you don’t come to Shanghai River and just eat soup. So next there were the Szechuan-style prawns—plump, juicy, and tasting of the sea. Also spicy, which I like. “What do you think?” asked Winston. I told him his English was fine. And the dishes he’d brought me were superb. And they were.